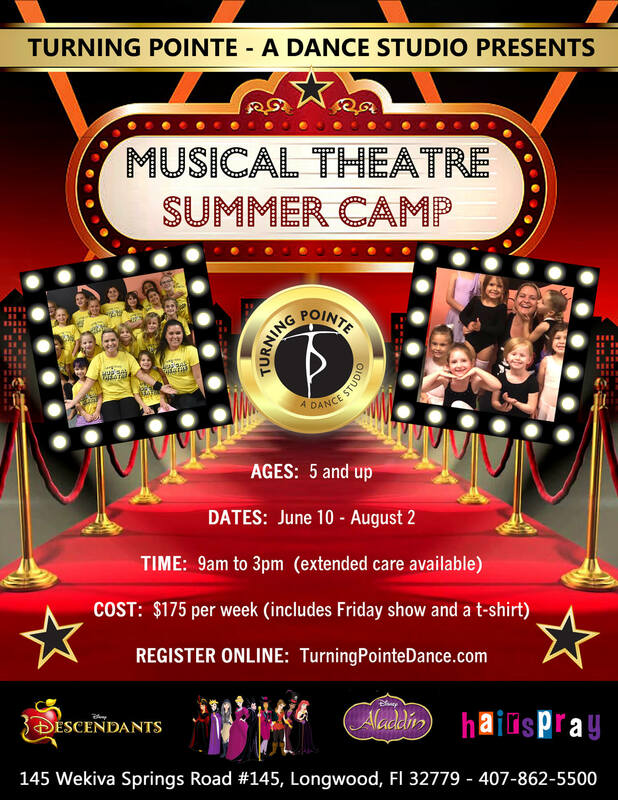 Everyday is a busy day at Musical Theatre Summer Camp. We sing, dance, and do skits - everyday! Each week is a different theme; featuring popular Movies, Musicals & Broadway shows. Students will learn to sing and dance to songs, memorize lines from scenes and we will perform a showcase every Friday! Each week brings the upbeat, lively songs from Hollywood & Broadway right here to Longwood! In addition, we will have arts & crafts, games and lots and lots of FUN…everyday! Students need to bring their own lunch but snacks will be provided. Includes a camp T-shirt and a performance EVERY Friday! featuring: Mamma Mia, Moana, Sound of Music & more! celebrating the classic movie being re-made- come fly on Magic Carpets with your favorite Genie & friends! featuring: Cinderella, Ursula, Belle, Cruella de Vil & more! star in your own JoJo concert and of course we will make BOWS! featuring: our favorite songs from the not so evil villain descendants!! celebrating the classic movie being re-made- come dance and sing with your favorite lions and animals! featuring: Mary Poppins, Toy Story, Dumbo & more! © Turning Pointe. All Rights Reserved.